Exhibiting & ROI: time to end the lack of accountability? Events are big business, particularly when it comes to B2B marketing. Over $500bn was spent on B2B events in 2017 alone, and a large proportion of that on sponsoring and exhibiting at trade shows. When it comes to other corporate marketing investments like PPC and Inbound Marketing / SEO, data relating to performance is a must-have. So why is it that when it comes to events, marketers are so lax about measuring their performance and assessing the return on their investment? Industry events have always represented an attractive sales and marketing channel for companies and the B2B events industry continues to thrive. In an increasingly digital world, events give companies a powerful opportunity to meet clients, prospects and peers from their industry sector face-to-face. Companies attend and exhibit at events for a variety of reasons, including brand awareness, networking and of course, lead generation. However, there is a price to pay in getting access to this highly targeted audience. The cost of exhibiting is significant, so it’s important for marketers to justify the investment. A significant factor is because the events industry has been slow to adopt to advances in technology, particularly when you compare against the ever evolving Marketing Technology landscape. Where the wider B2B MarTech space is surging forward through connectivity via APIs, machine learning and platform plays fuelling consolidation of B2B data, the event industry remains a decade behind. Organisers and events operate in isolation, attendee data is rarely connected from one event to the next and exhibitors are still forced to adopt old school lead capture methods. Paper forms, fish bowls for business cards or hiring badge scanners from the organiser to capture ‘leads’ persist despite their inherent flaws. These outdated processes fail to deliver the high standard of data needed to generate true Event Qualified Leads. And even when the organiser provides access to a slicker lead retrieval process such as a mobile app, for the exhibitor this is still disconnected from their existing systems and continues to result in inefficient post-show manual work to take action with the leads collected. Alongside the failure to embrace technology, exhibition booths are often manned by inexperienced and unprepared teams, looking to scan as many badges as they can, or gather as many business cards as possible. Quantity over quality with little regard for what happens after the event. Someone pitching their own business to reps on the stand can often become a ‘lead’ despite the fact they have no interest in the product or services on offer. So while it looks like lots of leads have been collected, numbers are overinflated when viewed in the cold light of day. Pure vanity metrics. Add to that the lack of process after the event, the long delays in processing the data and following up, and it becomes a little clearer as to why true event ROI is so elusive. I could write an entire piece on the pros (few) and cons (many) of relying on rented badge scanners for your lead capture process. My view is that it is a deeply flawed approach, ever more so in light of the GDPR. While GDPR has created some confusion around what companies can and can’t do with attendee data they receive from organiser-provided badge scanners, the fact remains that badge scanning is not lead capture. It’s contact collection, at best. The output after an event of badge scanning is typically a big spreadsheet filled with columns of generic data collected by the organiser pre-event (often months ago) and shared with every other exhibitor. Most of it is irrelevant: there’s no context of the conversation that took place at the booth and if there was any genuine buying interest. The data is completely disconnected from existing Marketing Automation and CRM systems, resulting in many hours of manual work. Event follow-up suffers long delays, and often organisations resort to sending out a generic, impersonal email a couple of weeks after the event, if at all. We need a completely different approach when it comes to evaluating event success, and thankfully the tide is turning. Measuring and delivering ROI needs to be essential for all marketers. Quality needs to beat quantity – and team members need to be held accountable for their contributions. If salespeople keep collecting business cards or scanning as many badges as possible – without proper qualification – responsibility needs to sit with them. It is far better to have meaningful engagements with a smaller number of prospects, where accurate data is captured, the lead is qualified properly during the conversation and follow-up is fast and personalised. Event Qualified Leads represent powerful sales opportunities that can be fast-tracked down the funnel. Post-event, marketers need to be able to quickly connect event leads into their existing marketing and sales workflows, to enable appropriate follow up and in turn, provide visibility on event ROI which, in the B2B world, may often take months to truly demonstrate. The use of event lead capture solutions like Akkroo can help exhibitors to ensure a modern, consistent and integrated approach. 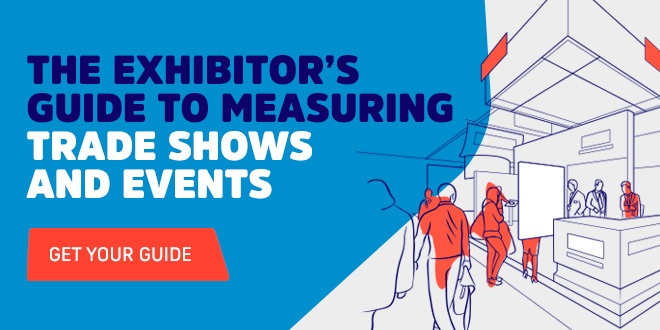 Exhibitors are increasingly taking greater ownership and accountability for their lead capture process, from ensuring they’re collecting quality data on the show floor, to processing it quickly through to their Marketing Automation and CRM systems to enable efficient follow-up. While there are softer benefits from exhibiting at events, we’re increasingly seeing B2B marketers take an ROI-first approach to events and organisers need to be able to enable their exhibitors to achieve that. Being able to re-book events with confidence, based on real data, represents a step forward in how most people view them at present. The good news is that by combining modern approaches to event lead capture with this new way of thinking means that CMOs around the world are slowly but surely able to evaluate event spend like they do with every other marketing channel. The question is, will the events industry keep up with the pace and adapt too?